How to trackstand on a Track bike. 3. Start with an easy gear, such as a 42-16. 4. Ride around out of the saddle in a clockwise circle, about 10 feet in diameter. 'B' is the 90 degrees clockwise from 'A' . 'D' is the 90 degrees clockwise from 'C' . 5. Start slowing down, feeling the different sensation as the bike transitions between going uphill (B) and downhill (D). 6. Start trying to go real slowly through the D - A region of the circle. This is the region you will use for trackstanding. Ride the rest of the circle as you were in step 5. The pedal are in a 3 o'clock - 9 o'clock arrangement (in other words, parallel to the ground). Your right foot is forward, your front wheel is pointed right. You are standing and shifting you weight to keep balance. If you start to fall left, push on the right pedal to move the bike forward a little and bring you back into balance. If you start to fall right, let up on the pedal and let the bike roll back a little and bring you back into balance. 7. Each time you roll through the D - A region, try to stop when the right pedal is horizontal and forward. If you start to lose your balance, just continue around the circle and try it again. 8. Play with it. Try doing it so that the bike and your body are pointing downhill, with the front wheel pointing uphill Try with various foot position, and various amounts of turn in your steering. Try it on different amounts of banking, or slope in the pavement. What you are shooting for is the feel that's involved, and it comes with practice. Start out in a nearly flat area. As you improve, you can increase the banking. Why is track bike specified in the title? A trackstand on a road bike is done differently. 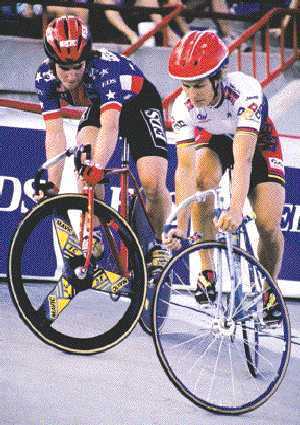 A track bike can be pedaled backwards. Road racing trackstands are done opposite of what is described. They take place on the A - B region of the circle, with gravity used for the roll forward. they also require a hill to accomplish the rollback affect (since they cannot backpedal). Why a gear around 42-16? This is a reasonable middle between too small, where you would reach the bottom of the stroke on the roll forward, and too big, where you couldn't generate the roll forward force needed. With experience, you can use a bigger gear. It's easier!! It can be done in while seated, but you lose the freedom to do weight adjustments with your hips. Why is the right crank forward? If your left crank was forward, you might bump the front wheel with your toe. Remember the steering is turned so that the back of the front wheel is on the left side of the bike. Some bikes have overlap of the region where the wheel can go and your foot is. Even if your current bike doesn't have overlap, it's better to learn the technique as described in case you are demonstrating your new skill on a bike that does have overlap. Why the D - A region? It's the easiest. If you wait till the bike is around 'D' or 'C', then you have to keep more force on the pedals to hold it still. What do I do if I want to stop on the downhill? You may need to backpedal hard, to slow dawn. Make sure your lockring is tight on your rear wheel. To get your pedals in the 3-9 o'clock position, you may need to 'hop' the rear wheel.